With the redi-Go, the Renault-Nissan alliance has taken it a step ahead of simple badge engineering like with the Duster and Terrano. 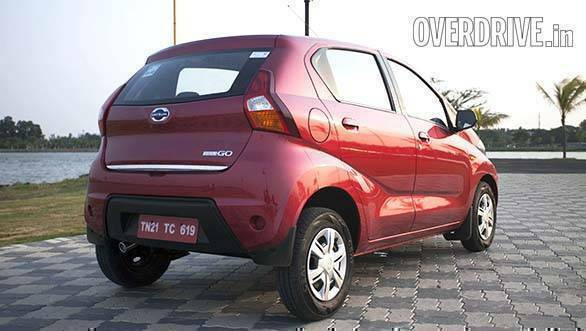 It's based on the same CMF-A platform as the Renault Kwid, but Datsun has given the redi-Go a completely different design. 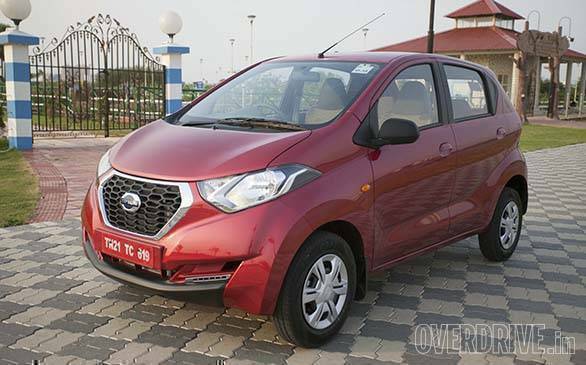 Positioned as an "urban crossover" with a high ground clearance of 185mm, the redi-Go, Datsun believes, will be a unique offering in the entry-level segment. We flew down to Kolkata to get a first-hand experience. 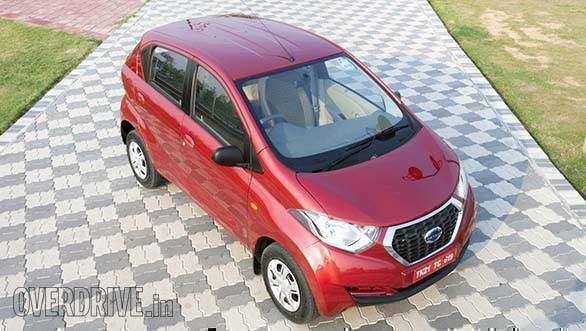 Datsun has done an amazing job with the redi-Go, with the design closely resembling the original concept. With its young, fresh styling based on Datsun's new Yukan theme which means brave and bold in Japanese, the redi-Go also manages to make the Go siblings look outdated. The front is dominated by the large hexagonal radiator grille with its chrome surround and a matte black mesh. It does look large for the overall profile but then Datsun wants it to be a signature trait that will also be seen on its future offerings. The wraparound headlights have a sleek design with chrome detailing on the inside. The front bumper gets a series of crease lines which makes the lower portion appear wider. Instead of fog lamps, it gets LED DRLs which we believe will only be offered in the top-end variant or as an optional accessory. The recess above the DRLs gets circular and squarish slots which make the design look unfinished. Front bumper also gets a plastic cladding to mimic a bash plate which is a smart addition.The first thing that you notice on the side profile is its height. Datsun claims that the tallboy design was not only done for aesthetics but also to provide better ingress and egress compared to that of its competition. Also, for substance on the side profile, there are two distinct character lines that flow along the length creating multiple layers. In addition, it gets flared wheel arches and bulging contours, especially on the rear. 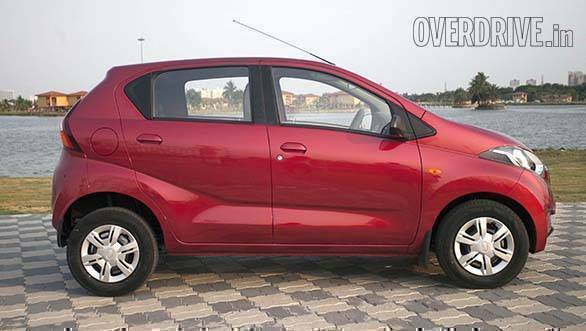 This is further accentuated with its tall ground clearance of 185mm, which is greater than that of the Alto 800 (160mm), Eon (170mm) and even the Renault Kwid (180mm). The redi-Go measures 3,429mm in length, 1,560mm in width and 1,541mm in height which makes the redi-Go shorter than the Hyundai Eon by 66mm, wider by 10mm and taller by 41mm. On the rear profile, the sharply raked character line gels into the tailgate to create the effect of a slingshot. The clear lens tail lights have been placed at a higher position which offers better visibility to cars around you. The redo-Go's rear bumper is wide and gets a chrome-treated exhaust pipe neatly tucked underneath. The faux skid plate can be seen on the rear bumper too. It is a step towards making the redi-Go appear like an 'urban-cross' (as Datsun likes to call it), but to me it just looks like a jazzy A-segment tallboy, at best.The instrumental cluster doesn't feel as modern as the Kwid's digital unit but displays the same amount of information like fuel efficiency, distance to empty, gear shift indicator and trip distances. 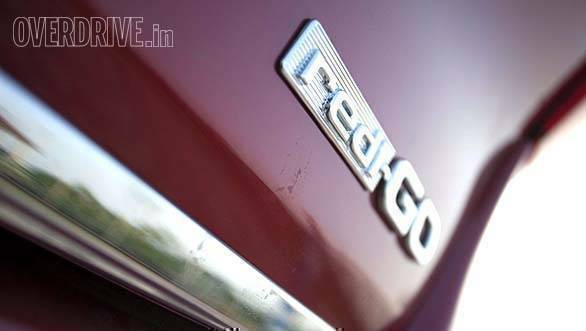 The redi-Go shares it three-spoke steering wheel with the Go range. The centre console isn't reminiscent of the Go though and gets a comparatively premium layout with a piano finished bezel around the single-DIN audio unit and the HVAC controls. Also, the redi-Go's entertainment unit offers USB connectivity too which is missing in the more expensive Go series. Is it better than the Renault Kwid? Not when you consider the Duster-sourced 7-inch touchscreen system, which comes with satellite navigation system and bluetooth telephony. Being 6'1 in height, I always have trouble crawling inside the cabin of entry-level hatchbacks, but in the redi-Go, it wasn't the case. The tallboy cabin design was of great help. In addition, the cabin offers generous headroom. The cabin can accommodate four average-sized adults and a kid; however, taller occupants will find it uncomfortable with the shortage of kneeroom in both the rows. I also felt that the seats were tad too small. In addition, both row seats lack under thigh support as well. However, I liked the tall seat positioning which Datsun claims was done intentionally to give a better visibility of the road. 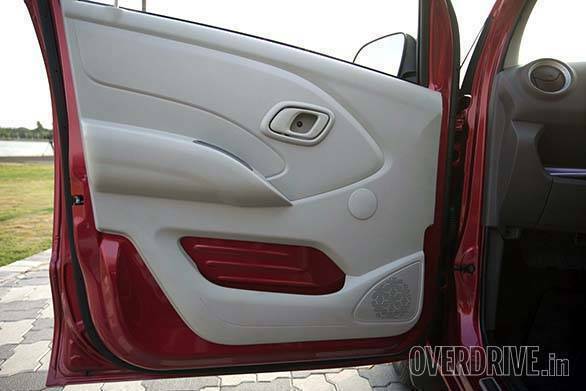 In terms of practicality, the front door panels don't offer useful storage  maybe enough space for a tablet device or a notebook. The glove box too is shallow on space and can only hold the vehicle documents at best. Under the dash, there are cubby pockets to make space for knick knacks. The 222-litre boot is sufficient to carry one average size suitcase, but the higher placed loading lip makes it difficult to haul. There are certain areas that highlight various cost-cutting measures like the lack of enough cladding around the pillars(exposed metal instead), seat mechanism and foot well or just having one reversing lamp instead of the usual two. 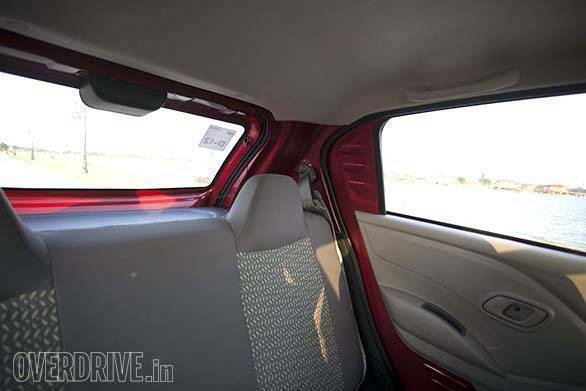 Justifying it by considering the price range of Rs 2.5  3.5 lakh won't be right, especially when you realize that even the Renault Kwid is positioned in the same segment and offers better quality of interiors compared to the redi-Go. All our doubts on the Datsun redi-Go getting a different tune of the engine compared to the Renault Kwid were cleared when Gerard Detourbet, managing director, 2ASDU Renault-Nissan Technology and Business Centre India clearly stated that both the motors are identical in nature. The Renault-developed 799cc petrol motor makes 54PS of power at 5,678rpm and generates 72Nm of torque at 4,386rpm. This aluminium-finished motor is claimed to be highly fuel efficient and extremely compact in construction. It weighs a mere 57kg and this was achieved with the use of a plastic oil sump and directly attaching the alternator to the engine block. 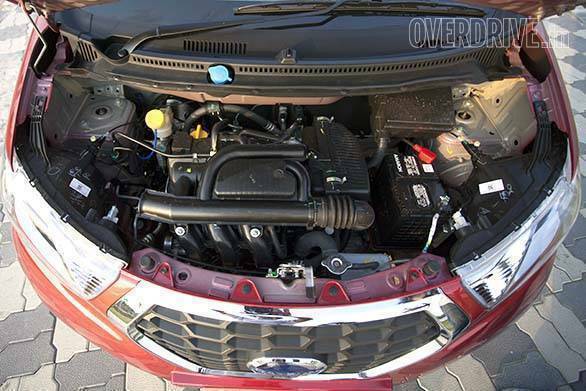 This motor is paired to a 5-speed manual transmission with gear ratios identical to the Kwid. Even the claimed fuel economy remains unchanged at 25.17 kmpl. While the Kwid hadn't made any claims about its 0-100kmph sprint, the Datsun claims 15.9s, with a top whack of 140kmph.Crank up the motor and you hear a familiar note. The engine idles at a little less than 900rpm. The motor doesn't feel eager at lower revs, but comes into its zone beyond the 2,800rpm mark. I liked the motor's mid-range performance, and the car feels a bit more energetic than the Kwid. But don't expect it to be as rev-happy as the engines in the Maruti and Hyundai rivals. That said, I appreciate its ability to cruise effortlessly at speeds of 80-90kmph in fifth gear. The engine refinement is impressive for this class, but at higher speeds, the motor noise starts seeping inside the cabin. With two passengers, the redi-Go's motor doesn't feel stressed but with four, the motor demands frequent shifts within the lower gears. This was felt especially while climbing flyovers. Speaking of the transmission, the unit is not the best in the business and the shifts feel rubbery. We believe that the AMT unit, which will debut in the Kwid by June-July 2016, could make a lot of sense on the redi-Go as well. After having driven the Datsun redi-Go on the busy streets of Kolkatta, I have realised that the redi-Go's setup is perfect for the urban commute. Previously, the Kwid at 660kg was the lightest car in this segment, but the redi-Go is even lighter than the Kwid by 25kg. Expectedly, the redi-Go feels light on its wheels while zipping around town. The top-end variants get a speed-sensitive electric power steering. 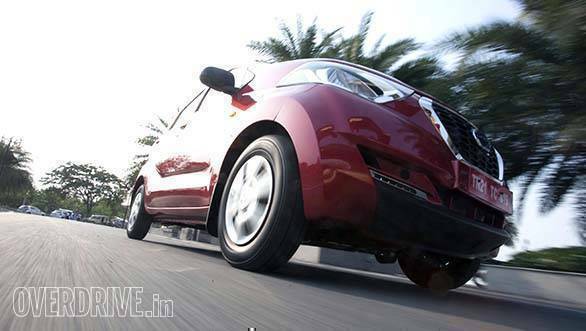 The steering weights up well at highway speeds but conveniently light at city speeds. Its tall seating position and compact bonnet make it easy for the driver to get a judgement and therefore, it's quite easy to drive in the city. The redi-Go is based on the CMF-A platform which also underpins the Renault Kwid. Datsun engineers confirmed that there were no significant changes on the platform for the redi-Go. The platform which is split into separate modules of engine bay, dashboard, front and rear underbodies and electrical/electronic architecture offers various possibilities. This effectively means that the same platform can spawn a hatch, sedan and even a compact SUV.Doing duty in the front suspension are McPherson struts with lower transverse link while the rear makes use of a twist beam with coil springs. 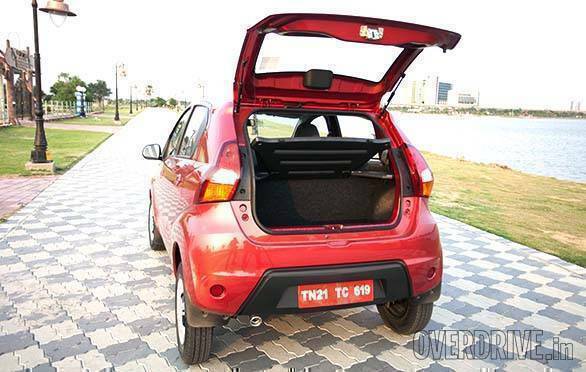 While the Kwid gets an identical arrangement, the length of the springs have been increased in the redi-Go. Thus the rebound has been reduced, but overall it's not a very noticeable change. Despite the tallboy design, body-roll isn't that pronounced. The grip levels of the 155/80 R13 Ceat tyres were good for city roads. Even on winding roads, the rubber holds on to the tarmac without losing on confidence. Ride quality is decent at city speeds, but at highway speeds the car has an unsettling feeling, again highlighting the fact that this is more of a city car after all. 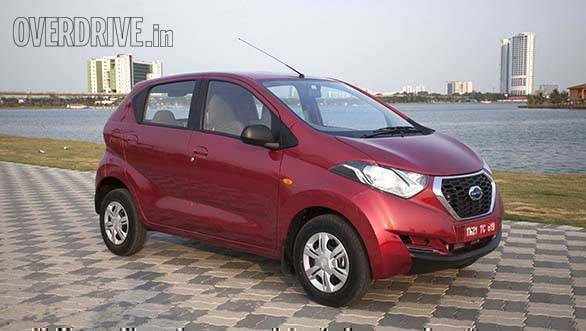 Overall, the youth-centric design of the Datsun redi-Go will be its strongest highlight. The expressive face and the muscular profile definitely make it a head turner. 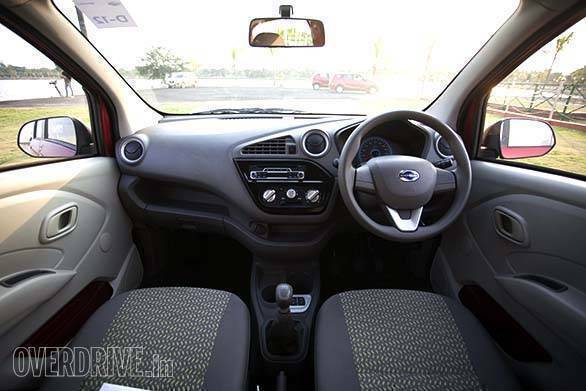 Its target price range of Rs 2.5-3.5 lakh is certain to increase footfall to the Datsun showrooms, but at that price its first threat comes from its own sibling, the Kwid. To me, the Kwid's crossover-inspired styling seems more convincing and the better quality of plastics and higher level of equipment seal the deal. The redi-Go will have to undercut the Kwid by a significant margin, but at this point it seems unlikely. The redi-Go won't have an easy time, but either way, the two-pronged approach towards the A-segment could work in the longer run for its parents at Renault-Nissan.